Space blankets also known as Mylar blankets, first aid blankets, emergency blankets, or thermal blankets are a low-weight, small blanket made of metallic heat-reflective thin plastic sheeting. This was first developed by NASA in 1964 for us in the space program. Their design reduces the heat loss in a person’s body which would otherwise occur due to thermal radiation, water evaporation, or convection. These blankets have been widely distributed in first aid and survival kits and can be purchased rather inexpensively. I have seen them on sale for $1.99 for a small blanket to $30 for a bivy sack that will hold a large man. If you are putting together a survival or first aid kit that will need to be stored in a very small container, space blankets can be useful. But first, you have to understand a few things about them. Many of them are fairly small measuring in the area of 56 (4 ft. 8) X 84 (7 ft.) inches in size. This is small if you are a fairly large man, they will not wrap around you, never mind work for two people like it suggests on much of the packaging. Space blankets only serve to prevent heat loss in the following ways. The airtight material reduces the loss of heat by convection. The reflective surface inhibits losses caused by thermal radiation. Unlike a wool blanket, the space blanket does not have any insulation to trap air and keep you warm. If you are hypothermic, you will need to have an outside source of heat. The space blankets manufactures claim that they will reflect back up to 80% of your body heat. But remember you are still losing 20%; depending on the temperature they may just slow down the rate at which hypothermia kills you. They are waterproof and can keep the rain off you, but because they are waterproof, if you are wrapped in one, they will not breathe and will hold your moisture in. This may cause your clothes to become damp. The optimum is to be warm and dry not warm and wet, or even damp. They can make an excellent sunshade to protect you from the sun. There are many articles written on how you can use space blankets to hide from infrared searches. There is some true to some degree. If used correctly they can reduce your chances of being found. First, there must be open air between you and the blanket or your body will slowly heat up the blanket. Second, the blanket itself will make a unusual light signature, so you must do something to break up the thermal patterns. In the next few days, I will post an article on hiding from infrared thermal devices. If you are purchasing a space blanket, look for the largest heaviest one you can find and then carry two. 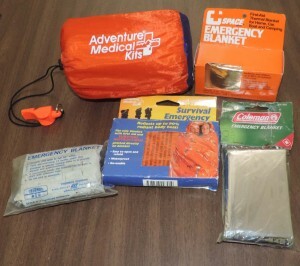 The best one I have found is also the most expensive and that is the bivy sack made by Adventure Medical. This is a bivy sack made from a type of space blanket material that is large enough for a 6 ft 6 in 250 man. They come in a small stuff sack and are about the size of two fists. Unfortunately, you have to pay for the best and they are about $30 each. Space blankets if used within their limitations can be very useful and save your life. Cooking Wild Eggs Over an Open Fire and Other edible Eggs. This entry was posted in survival and tagged space blankets. Bookmark the permalink. 2 Responses to Space Blankets, are They Good or Bad? The Adventure Medical bivy sack, when stuffed with natural insulation, such as pine needles, thatch (best), dry grass, or leaves, is much more effective than the bivy used alone. Best use of the Space Blanket is as a rain, wind and snow resistant cover for the USGI poncho liner. I carry the bivy sack, a GI poncho and two poncho liners, and have slept outdoors in mild, wet conditions in relative comfort. These might as well be called ‘magic blankets’ the way people carry them and assume they must work. The manufacturers’ claims that these blankets or bags reflect back up to 80% of body heat is misleading. What they mean is ‘radiant heat’, which is actual waves of heat energy like you get from a candle or the sun. But we only lose a tiny fraction of our body heat in this way when inside one of these blankets. About 10%. That means you might be reflecting back 80% of that 10% of the heat you’re losing. Sound good? The rest is lost through convection and conduction. Even if you prevent air from escaping the bag, or wind from blowing your heat away, it will still be conducted through the bag very quickly. People who try one for 5 minutes say they can feel the heat coming back, but that’s because they’re putting out lots of heat and 10% is noticeable. After an hour or so it gets very cold and damp. There are much better forms of insulation and shelter for emergency use than these. Equipment meant to save lives should be chosen primarily on its ability to do the job properly, not on it’s light weight.